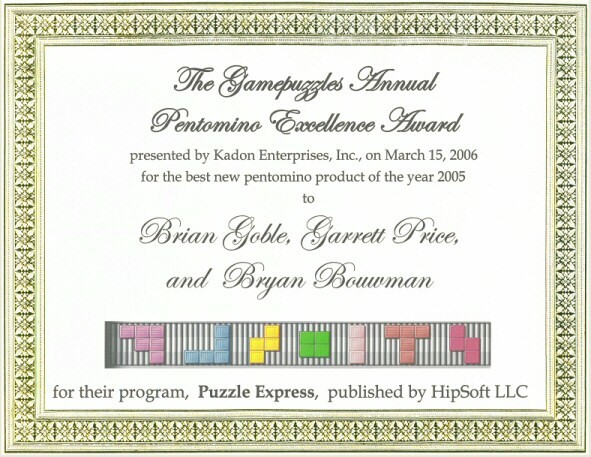 Kadon created this annual award to be presented to an individual or organization that published the best new pentomino or polyomino challenge of the year. For the year 2005, this distinction was won hands-down by HipSoft LLC for their RealArcade game, Puzzle Express. Kadon presented the three creative talents  Brian Goble, Garrett Price, and Bryan Bouwman  with the certificate shown below, and the one-of-a-kind customized puzzle shown above, made in lasercut acrylic. The striking diamond solution is by Jack Wetterer and Chris Patterson. Congratulations to HipSoft LLC for creating a classic with all the right features: suspense, challenge, music, historical background, variety, even superb photos, tracking players' scores, and clean and witty graphics. Puzzle lovers are invited to visit HipSoft and download a free demonstration version of Puzzle Express, or just go ahead and order the full version right away. It is unlimited fun and challenge. Also check out their many other downloadable games.